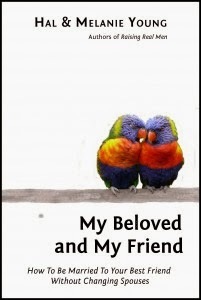 Hal & Melanie Young have written another fabulous and much-needed book, My Beloved and My Friend: How to Stay Married to Your Best Friend Without Changing Spouses. Brilliant book. Of course it is; I knew it would be. They are the folks behind Great Waters Press, the ones who wrote Raising Real Men. (That link is to the review I wrote nearly three years ago.) I loved that book, and I knew I'd get a lot from this one too. Loving a book doesn't always make it easy to review though. I want to sit down, over a cup of coffee (or tea, if we invite Melanie into the conversation) and talk about just why I think this book is important and wonderful. But writing it is hard. Hal and Melanie Young have been married a few years longer than we have (they've at 25+ years), and they clearly have a successful marriage. They also have a whole bunch of really amazing kids. Samuel has a special place in my heart, but that has to be a separate post. This book covers so many incredible areas, and the Youngs aren't afraid to tackle controversial or uncomfortable topics. Submission, for instance, where they said a lot, but I dearly loved the quote, "﻿He needed a wife, not a robot!" in that chapter. From the opening chapter, "Leaving and Cleaving," I knew this was a book I needed to read. One would think that after 20+ years of marriage, we'd have some of this stuff down, especially regarding something that sounds like it is supposed to be a newlywed issue. We have done some things right. We moved 1,000 miles shortly after we were wed, and that was definitely a "leaving and cleaving" thing. The health of our marriage depended on it. Now that is a lesson I want my kids to learn before they wed. Leaving and cleaving means turning from a "me" to an "us" -- but it also means that the "us" they already have (their parents and siblings) can no longer be the most important "us" in their lives. In nine more days, as a certain son of mine just reminded me, I'll be the mother of three teenage boys. Leaving and cleaving is not necessarily some far-off, abstract concept. That means I need to be prepared to do my part too. I have some great examples among my friends and family of fabulous in-laws, and some not so fabulous ones. I desperately need this book to help me remember which type I plan to be. Wow, have we ever seen that borne out in our lives and the lives of those around us. Unfortunately, usually what we've seen is the opposite... "a wife who constantly points out his failures and shortcomings will probably succeed only in depressing his efforts to overcome them." That is a lesson we've really worked hard to get our boys to grasp. They need to find women who will believe in them, not belittle them. Doesn't matter how pretty she is, how perfect, how much other guys envy them. In the long run, a woman capable of respecting her husband is the better catch. What I loved about Raising Real Men was how Hal and Melanie give all kinds of great advice, but they don't make a whole lot of "this is the best/only/Christian way" statements. When addressing things like who should keep track of the checkbook, for instance, they talk about the strengths of each partner, not some patriarchal "should" language. So maybe it is best for the husband to manage the checkbook, maybe it is best for the wife to do it, maybe there is a time to switch that up, or maybe they ought to do it together. What is right for one couple may not be the answer for another. Who should read this book? Well, I think any married person could get something out of it. I think it would be great pre-marital "counseling" too. And I think it is fantastic for parents of teens and young adults, as a primer in the "these are issues you may want to be sharing with your children before they get married" category. The book will cost $15, and is due out for Valentine's Day. However, you can pre-order and spend just $12, and have it in time for Christmas. I recommend it. I may start making it a standard wedding gift. You can read more reviews from the Bow of Bronze Launch Team. There are some great ones there. Great review! Hard to condense a lifetime of learning into one book, let alone one book review. You shared some great thoughts here.